A while back I wrote a post about LeBron James endorsing the not terribly popluar Kia K900 luxry car. While I give L Bron credit for actually driving the car in real life, I was skeptical on whether or not his endorsement would have any meaningful impact on sales. It has at least sold one car, I now know. "Wait a second...are you telling me that there is a sizable enough percentage of the 40+ crowd that actually determines their auto purchases based on what a celebrity is driving? Maybe I am a little cynical on the power of marketing, but not once has a customer come to me and said, "I want a car like (insert famous person here) drives." This email is in response to your article entitled below. I am 61 years old and a basketball fan. I think Lebron James is the best basketball player on the planet. Not only that but he is an admirable young man. An excellent husband, father, and son. I don't think we could ask him to be and represent as a better person, at 29 years of age. He is all of the preceeding and he is smart! I buy products because Lebron endorses them. If it is good enough for LeBron it is good enough for me. He has a spirit of excellence and that is what I strive for. 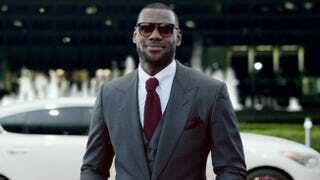 My hat is off to Lebron James. I hope he continues to endorse products and guides my purchases. Because this is the internet, many of you will be suspicious and assume the above message is fake or some sort of troll. Some quick Googling did reveal that the message does indeed seem like it was sent from a real person, who really is a LeBron James superfan. The reader never says she bought a Kia, but if she did, and she bought a Kia K900 she'd be one of the rare 119 people who did last month.